The mortgage lending environment over the past 10 years has seen a large swing in credit availability which has been most dramatic for minority populations. African-American and Hispanic borrowers saw enormous gains in homeownership in the years leading up to the financial crisis, but tighter credit conditions since the crisis have hit these populations harder than their white and Asian counterparts. Given the dramatic growth projected in minority populations in the coming years, we must take action now to expand access to mortgages so homeownership can continue to serve as a bedrock of the US economy. African-American and Hispanic borrowing peaked in 2005, exactly when home prices peaked and subprime and exotic mortgage products were proliferating. In other words, a disproportionate number of non-white borrowers purchased homes in a lax lending environment—exactly the wrong time. Beginning in late 2005, and accelerating during the financial crisis, home prices declined resulting in a spike in delinquencies and foreclosures. Many of the families who became homeowners during the run up in prices and freely available credit faced great distress several years later. Now that credit has tightened so severely, minority populations are disproportionately blocked from the market, unable to buy a home and build the wealth and economic stability that is associated with ownership. How hard is it to get a mortgage credit today? At the Urban Institute’s Housing Finance Policy Center, we have been tracking the availability of credit and closely watching the shifts in lending that creates a tight credit environment. Our Housing Credit Availability Index measures the probability that mortgage borrowers will become delinquent on that mortgage for 90 or more days, which we refer to as the default risk. This measure indicates that the probability of default rose from 12 percent in 2001 to a peak of 16.5 percent at the end of 2005/beginning of 2006, before declining to the current level of 5 percent. Stated differently, lenders are currently taking less than half the credit risk they were taking in 2001, a period of reasonable credit standards. Lenders are also taking less than one-third the credit risk they were taking in 2005-2006, a period when credit standards were too loose. 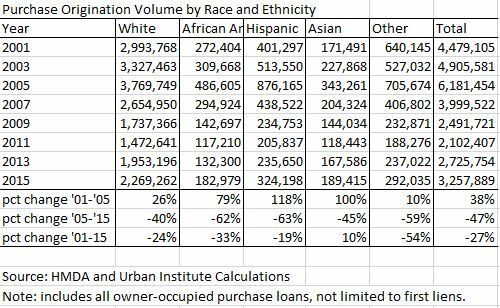 Table 1 shows the percent of new mortgages taken out to buy owner-occupied homes by race and ethnicity from 2001-2015. The share of non-Hispanic white (NH white) borrowers dropped from 67 percent in 2001, to a low of 61 percent in 2005, before increasing to 70 percent in 2015. The African-American borrowers share increased from 6 percent in 2001 to a high of 8 percent in 2005, before receding to 6 percent in 2015. The Hispanic share increased from 9 percent in 2001 to 14 percent in 2005, before declining to 10 percent in 2015. Asians are the only minority group whose market share has not declined in the post crisis period—increasing from 4 percent in 2001 to 6 percent in 2005, and remaining at close to that level ever since. From 2001 to 2015, the total number of mortgages taken out to buy owner-occupied homes declined by 27 percent. Further examining that decline, the number of loans to Hispanic borrowers declined 19 percent, while loans to NH white and African-American borrowers declined 24 and 33 percent respectively. The number of loans to Asian borrowers actually increased 10 percent during this period. When we break these changes down into two distinct time periods—2001–2005 (the peak) and 2005–2015—we see quite clearly that minorities had a bigger boom and a bigger bust than white borrowers. From 2001-2005, African-American and Hispanic borrowing increased 78 and 116 percent respectively, compared to an increase of 26 percent for NH white borrowers. In the second period, from 2005-2015, minority borrowers declined by 62-63 percent compared to a 40 percent decline in NH white borrowers. How do we open up access to mortgages? Tight credit has directly and dramatically decreased the number of owner-occupied purchase mortgages being made in the current environment with a much bigger negative impact on minority borrowers than white borrowers. This disparate impact is largely due to the differences in credit scores between white and non-white borrowers. So what can be done? Lenders need to a re-evaluate the underwriting tool kit with an eye toward changes that would specifically help minorities regain ground on homeownership. For example, lenders could consider the income of members of multigenerational families who are not parties to the mortgage. Lenders could evaluate borrowers more holistically, considering both primary and secondary jobs. This analysis needs to consider how to evaluate secondary jobs that might be changed regularly but consistently maintained. Many minority borrowers do not have a deep credit history so using credit scores such as Vantage or the new versions of FICO rather than a FICO model released in the early 2000s, which score many more borrowers, would be very beneficial. If we don’t address the disparate impact that the tight lending environment has on minority homeownership, fewer households will become homeowners at exactly the point in the economic cycle when it is most advantageous to do so. And minorities will continue to miss this wealth-building opportunity. The median family wealth for homeowners is $195,400, with their home the most valuable asset for most; the median family wealth for renters is $5,400. This disparity has consequences for the housing market and the broader economy. Fewer potential homebuyers means the housing market will continue to recover more slowly. At the same time, fewer buyers create a strain on other benefits to the economy which homebuying brings such as spending on home goods and an increase in construction jobs. The housing boom and bust hit minority, particularly African-American consumers hard and today’s exceptionally tight credit environment exacerbates the challenge. As the minority population continues to grow in this county, this disparity in homeownership will increasingly impact our economic vitality. The time is now to act and responsibly expand access to mortgage credit to the full range of credit-worthy borrowers. 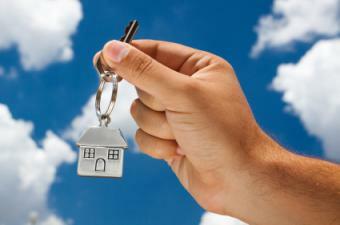 Previous: Could Housing Incentives Boost Inventory? Laurie Goodman is the co-director of the Housing Finance Policy Center at the Urban Institute. Before joining Urban in 2013, Goodman spent 30 years as an analyst and research department manager at a number of Wall Street firms. Goodman currently serves on the board of directors of MFA Financial, a Real Estate Investment Trust, is an advisor to Amherst Capital Management (ACaM), and is a member of the Bipartisan Policy Center’s Housing Commission, the Federal Reserve Bank of New York’s Financial Advisory Roundtable, and the New York State Mortgage Relief Incentive Fund Advisory Committee. She has published more than 200 journal articles and has co-authored and co-edited five books. Alanna McCargo is codirector of the Housing Finance Policy Center at the Urban Institute, where she focuses on center management, development, and strategy, including the cultivation of innovative partnerships within Urban and with external stakeholders. McCargo has over 20 years of experience in housing finance, policy, and financial services. She has worked in the private, public, and nonprofit sectors on programs, policies, and research to improve access to housing and mortgage finance.